We (Kiss and Wink) have tried all types of mascaras and this new one by L’Oreal is absolutely amazing. How many of you are aware that L’Oreal owns Lancôme? Well, it’s true and that’s why we believe that their products can be the same high quality at a more affordable price. So, let’s talk about this amazing mascara and why mascara is a must have part of your daily makeup routine. Please don’t leave out the house without at least mascara on. This is just one of the many mascaras that we love, please keep reading we will reveal other fabulous mascaras soon. Why Mascara should be a part of your daily routine? Mascara makes your eyes appear awake. It enhances your natural color and gives them a “Pop”. Your lashes instantly appear longer and fuller. If you don’t like the way your lashes look with mascara then you are not using the right one. It can enhance the shape of your eye and ladies guys love it when you “bat” them. We love mascara and we don’t leave home without it and you shouldn’t either. 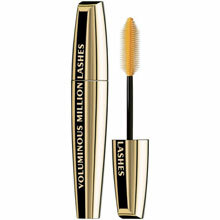 L’Oreal introduces New Voluminous¤ Million Lashes™ mascara, our most revolutionary collagen-infused formula and Millionizer Brush for amplified volume and definition. Our No Clump Formula : This luxurious, buildable formula amplifies each lash instantly. Glides on smoothly, and lasts all day, while thickening and separating every lash for clump-free flake-free, smudge-free look. Our Millionizer Brush : Uniquely designed to amplify and separate lashes from corner to corner while building breathtaking volume. Our Clean Sweep Wiping System : This built-in wiper ensures that just the right amount of formula is deposited on the brush for ultra-volumized, defined lashes. Suitable for sensitive eyes & contact lens wearers. To Use : Place brush at base of lashes and gently sweep up to tip. Removes easily with soap and water. You can locate this product at a drug store nearest you or shop www.loreal.com. We give this product a Smooch and Three Winks!